The National Quality Standard (NQS} sets a new benchmark for the quality of children's education and care services in Australia. The NQS covers most long day care, family day care, preschool/kindergarten and outside school hours care services. Services are assessed and rated using the seven quality areas, 18 standards and 58 elements that make up the NQS. 58 Elements are assessed when Regulatory Authority Officers visit your child's service. Elements are assessed as being met or not met. If all elements are met, the standard will be rated Meeting National Quality Standard or Exceeding National Quality Standard. 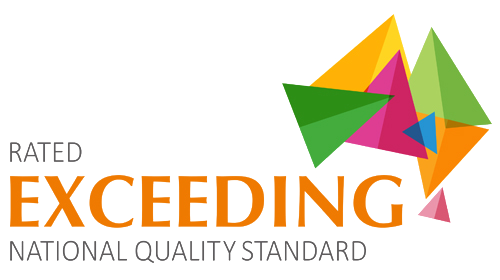 If one or more elements are not met, the standard with be rated “Working Towards National Quality Standard”. The quality areas will be rated by calculating the rating of all the standards within the quality area. If a quality area or regulation is not met and poses an unacceptable risk to the health, wellbeing or safety of children the service will be given Significant Improvement Required for the quality area and overall rating. This will usually mean that urgent action is needed to fix the problem. If one or more standards are rated Working Towards National Quality Standard, the quality area will be Working Towards National Quality Standard. If all standards are met, the quality area will be Meeting National Quality Standard. Our service has been rated against the National Quality Standard for Early Childhood and Care and School Aged Care and these ratings have been awaded in accordance with the Education and Care Services National Law Act 2010 and the Education and Care Services National Regulations 2011.